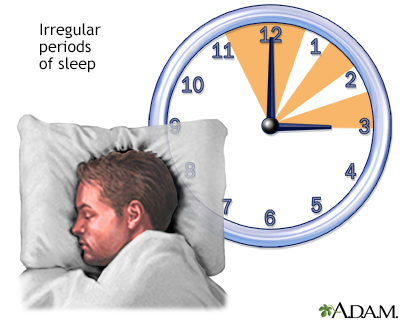 Sleep disorders are problems with sleeping. These include trouble falling or staying asleep, falling asleep at the wrong times, too much sleep, and abnormal behaviors during sleep. Kryger MH, Rosenberg R, Martin L, Kirsch D. Hypersomnolence. In: Kryger MH, Rosenberg R, Martin L, Kirsch D, eds. Kryger's Sleep Medicine Review. 2nd ed. Philadelphia, PA: Elsevier; 2015:section 4. Sateia MJ, Thorpy MJ. Classification of sleep disorders. In: Kryger M, Roth T, Dement WC, eds. Principles and Practice of Sleep Medicine. 6th ed. Philadelphia, PA: Elsevier; 2017:chap 61.